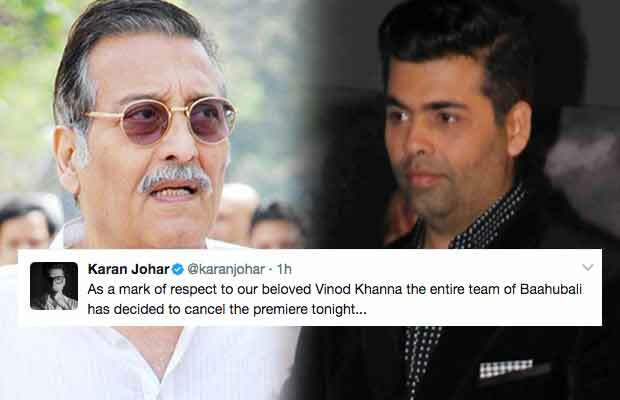 Karan Johar, whose production house has co-produced Baahubali 2- The Conclusion, had planned to host a lavish premiere today in Mumbai.But following the news of veteran actor, Vinod Khanna’s demise, has announced the cancellation of the event. It goes without saying that it would have been a power-packed premier with the A-listers of Bollywood and the industry attending this S.S. Rajamouli’s magnum opus. The film is set to release this Friday, i.e. 28 April and The invites too were sent out as well but now as there is no time to reschedule the planned premiere, the event has been scrapped altogether. Vinod Khanna breathed his last on Thursday morning in Mumbai after battling cancer for many years. The actor was suffering from advanced bladder carcinoma (bladder cancer). He was 70. He was hospitalised in April first week due to severe dehydration but was later said to be stable and responding positively to treatment. Vinod, who was a sitting Bharatiya Janata Party member of the Lok Sabha from the Gurdaspur constituency in Punjab, was last seen on the silver screen in Shah Rukh Khan’s Dilwale. Known as one of the most handsome actors in Bollywood, he is popular for films like Mere Apne, Insaaf and Amar, Akbar, Anthony. Previous articleVinod Khanna Passes Away, Bollywood Celebrities Pay Heartfelt Tribute! Next articleDeepika Padukone Sizzles And Dazzles In This Title Track Of Sushant Singh Rajput-Kriti Sanon Starrer, Raabta And How! !